Wherever you live, it’s not easy to find comfortable shoes if your feet are wide or swollen, but in Beaconsfield, Sandpiper Footwear is easily available. 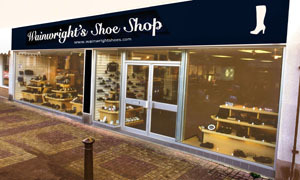 A wide range of footwear in Extra Wide Fittings available right here in Beaconsfield. We have a high quality range of comfort shoes, slippers and sandals for wide, swollen or sensitive feet, including shoes for diabetics and shoes for orthotics. Extra Wide Comfort Hosiery for the fuller figure. Situated near to junction 2 of the M40 Beaconsfield is extremely well situated for you to get to easily. They are a few miles from High Wycombe and also just on the outskirts of outer London. They have recently refurbished the shop and introduced air-conditioning to give you a pleasant shopping environment. As with the Princes Risborough shop you will find a huge floor area bursting with shoes from many varied suppliers. It is this selection of stock allied with their service which sets them apart from the rest of the crowd.